KIEV, Ukraine -- On September 6, 2016, while making an annual speech to Parliament, the President of Ukraine, Petro Poroshenko discussed the number of pro-Russian fighters in the separatist-held Donbass. "The pro-Russian separatist forces in the Donbass amount to almost 38,500 people, more than 600 tanks, 1,250 combat armored vehicles, 750 artillery systems, and about 300 multiple launch rocket systems," Poroshenko said. On February 22, 2017, during a meeting of the Command of the Armed Forces of Ukraine, President Poroshenko disclosed the data on the number of Russian troops, weapons, and bases situated near the Russian-Ukrainian border in the Donbass. According to the Supreme Commander of the Armed Forces of Ukraine, the Russian army units deployed near the Ukrainian border consists of up to 50,000 as well as 470 tanks, 1,700 armored vehicles, 390 artillery systems, 220 MLRS, 490 combat aircraft, hundreds of helicopters, and 24 warships. He also said that the Russians are creating, expanding, and upgrading existing military bases and other military facilities. "In the southeast of our country, in the Donbass, Russia has formed two army corps, which are composed of six mechanized brigades, one infantry brigade, three regiments, two artillery brigades, and other units. The command, supplies, and overall support are, of course, provided by the aggressor - Russia. In addition, the composition of these forces includes regular units of the Armed Forces of the Russian Federation, the number of which already amounts to about 3,500 people." However, on April 10, 2017, on HARD TV show with Natalia Vlaschenko on ZIK TV, the Acting First Deputy Chief of the General Staff of the Armed Forces, Major General Viktor Nazarov provided a different number of separatist fighters in the Donbass and Russian soldiers near the Ukrainian border. "In some areas of Donetsk and Luhansk, the number of fighters has reached 32,000-33,000 people. It's an army there. In addition, we are estimating that there are also additional forces and equipment, which are close to our borders in Russia. This is 30,000-40,000 thousand more people. It does not necessarily mean that they will cross the border, however these divisions are a resource which strengthens the separatists while they are performing their tasks," Nazarov said. If we compare the data announced by the Supreme Commander of the Armed Forces with the data provided by the Acting First Deputy Chief of the General Staff of the Armed Forces, it turns out that the number of separatists in the uncontrolled areas of the Luhansk and Donetsk was reduced from 38,500 to 32,000 fighters, and, accordingly, the number of Russian troops on the border, from 50,000 to 30,000 soldiers. In fact, it is obvious that Major General Nazarov publicly denies and disproves the data provided by the Supreme Commander – the highest official of the Armed Forces of Ukraine. The President is the Supreme Commander of the Armed Forces of Ukraine in accordance with Article 106 of the Constitution of Ukraine. 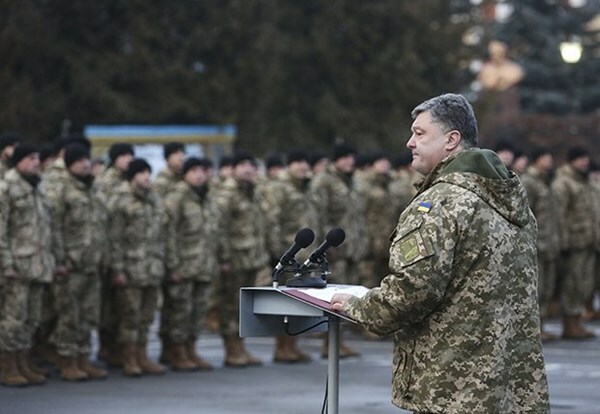 In the event of armed aggression against Ukraine, the President makes the decision to use the Armed Forces of Ukraine in order to defend the state against the aggressor. The President heads the National Security and Defense Council of Ukraine. It should be noted that in his speech on February 22, 2017, Poroshenko emphasized that an aggressive policy is a part of a very dangerous game, which Russian leadership is playing to radically change the geopolitical landscape of the entire European continent. "The threat of a full-scale Russian aggression has not gone away. And the threat not only oozes through the uncontrolled areas in the Donbass - it looms across all of the Russian border, and beyond,'' the Supreme Commander said during the meeting of the General Staff of the Armed Forces. ''There is no guarantee that at any time, an invasion will not be thrust upon us." The number of separatist fighters and Russian soldiers on the border is indicated in the official data of the Armed Forces of Ukraine. A situation where there are discrepancies between the data provided by the Supreme Commander of the Armed Forces and the Acting First Deputy Chief of the General Staff of the Armed Forces is unacceptable. It is noteworthy that the court’s decision in the case of Major General Nazarov states that according to his official duties he had all the means to prevent the deaths of servicemen, but, as a result of the negligent execution of his duties and not taking into account the intelligence information, did not use them. Explaining his position on not taking into account information provided by intelligence, during a speech on ZIK TV, Nazarov said that "this information is not assumed to be a normative document." The Major General explained that all official documents which are used in the Armed Forces must have the appropriate essential details and signatures of the officials who are responsible for the information. "If someone would have reported this information to me, the document would have had my signature on it," Viktor Nazarov said. The question that remains is whether the information provided by the Supreme Commander of the Armed Forces during a meeting of the General Stuff of the Armed Forces of Ukraine is a normative document for Nazarov and if it has his signature on it.